The annual national level HR Symposium of Goa Institute Management, Anveshan was recently held at the institute’s campus where Prabir Jha, the global CHRO of Cipla, advised students about career opportunities, leadership, and future challenges. 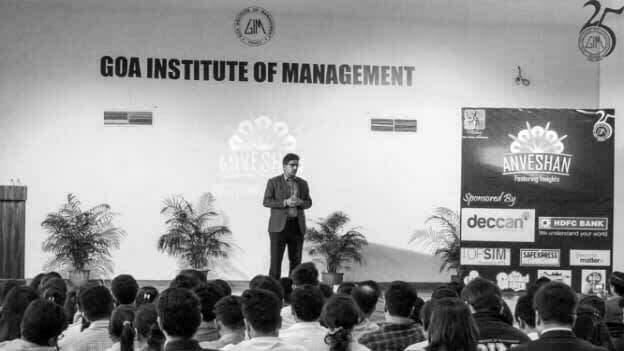 “Time is turbulent but exciting and there is no guarantee for next 30 years,” says Prabir Jha to a group of students at Goa Institute of Management at their National HR business symposium organized by HRiday. “The institute will prepare you to join the industry and your expertise will take you to a certain point, but it’s important for you to understand the whole gamut of Human Resources function and all stakeholders,” Jha adds. Noting that the world is interdisciplinary, Prabir urged students to understand all business functions and gear up to add value to whatever they do. The first day of Anveshan, 2019 started on a very enthusiastic and positive vibe where Jha advised students on their personal and career choices. Believing that "the ability to think beyond the obvious" is the core to becoming a great leader, he said, "in your life and career you will be making decisions that will be momentous. Look asymmetrical and do not lose out on the risks and opportunities that come with it." The insights shared were in line with Anveshan’s theme this year—Fostering Insights. By the end of Gyaanodaya, the keynote address of Anveshan, Pabir Jha left the students with insights shared through his talk. He urged the students to be authentic and passionate towards their goals; develop a sense of curiosity; challenge, push and change the world. Noting that leadership is one of the biggest crises and that people don’t want to upgrade their leadership qualities, he urged students to “be authentic and follow your passion to fulfill your larger purpose”. “Uncover your sense of curiosity”, adds Jha, and “be a master networker, leave a positive impression, and deliver what you promise”. The world of HR is changing where jobs like payroll are outsourced. And hence “your job as HR leaders will be getting larger things done”, Jha reiterates. Talking about trends, Jha urged upon the students to be exploiters of technology. Your world is going to be about how you make use of future opportunities and there is nothing called the perfect job. Jha sees a cynicism among younger generations which bothers him most. He says, “you have to strengthen yourself from within, convert bad experiences to good experiences, and don’t fall prey to skepticism which derails you.” There are tough moments and there are good moments but at the end of the day, you are the CEO of your careers. The two-day event also saw students participating in various activities. 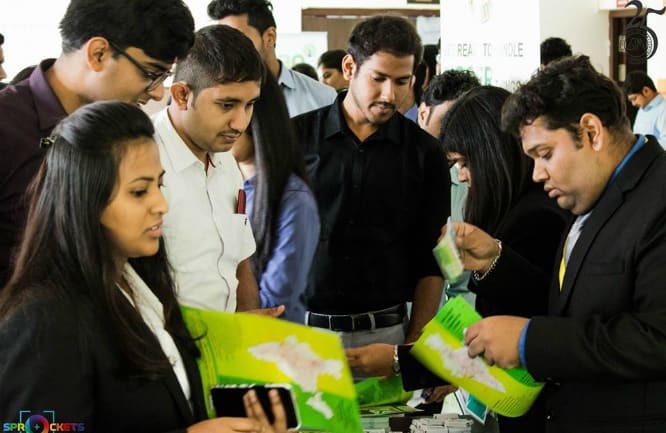 Samiksha, the live HR case study under Anveshan 2019, saw heavy footfall from teams from other top B-Schools. The event had Atma Godara Business partner People operations and Venkatesh Naga, fulltime faculty and Placement Chair at Goa institute of management as the panel of judges. Sarah Oliveira Fernandes, HR manager of Deccan Fine Chemicals, the title sponsor of Anveshan had also graced the event and gave away the prizes. The outstation teams took away a cash prize worth 60,000. Margdarshan is a unique competition that facilitates industry-student interaction through a simulation game played by participant teams wherein the teams are guided by mentors from various industries. The event this year had mentors coming in from companies like Varun Timble from IFB, Parag from Kineco, Gaury from Tevapharma, and Akshay Pednekar from Unichem laboratories. HRiday the HR club at Goa Institute of Management also organised an afternoon of HR Analytic learning under the event called Yukti, an HR Analytics workshop. The workshop was conducted by Nirmala Garg, Principal consultant- Middle Earth HR and revolved around the topic HR Data Analytics: How should HR change to stay relevant. This year, the HRiday team brought in another workshop to facilitate team building through music. The team organized Come and drum with us through Drum-E-Baazi by Machhli the art space and gave the students an opportunity to learn and work in teams by playing some djembe's whilst enjoying the feeling of being one with the music. The students reported that there was something therapeutic and euphoric about the whole experience.